The 2017 colt, who is yet unnamed, is by KM Bugatti and out of Wings Mon Cherie. 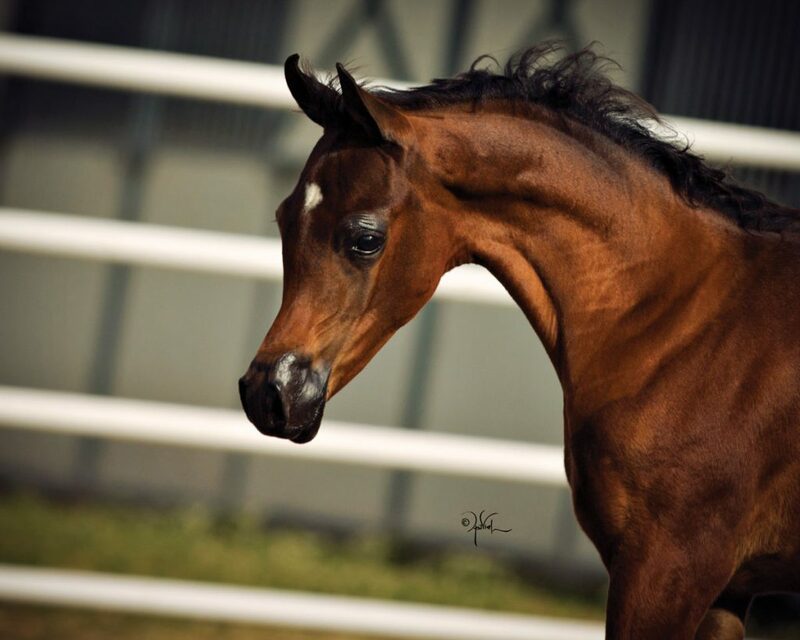 He is bred and owned by Julie Koch, Wings of a Dream Arabians, Martell, Nebraska. 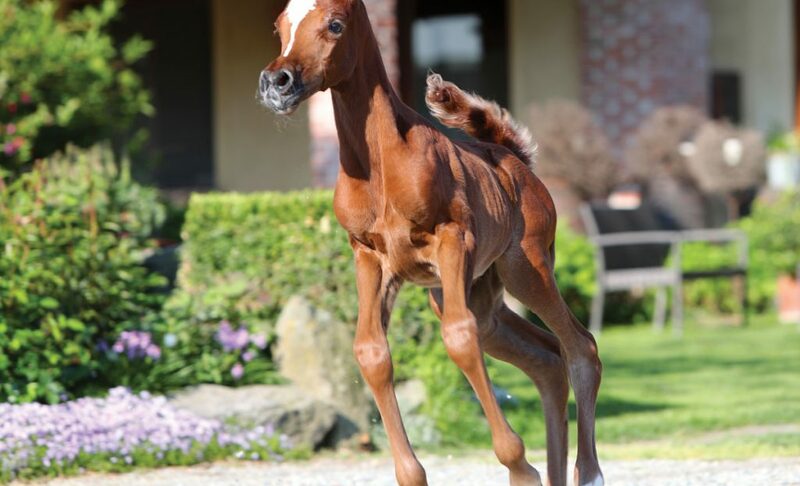 The 2017 filly Passiflora Le Soleil (ZT Magnofantasy x Laheeba Le Soleil), bred and owned by Elvis Giughera, Le Soleil Stud, Italy. 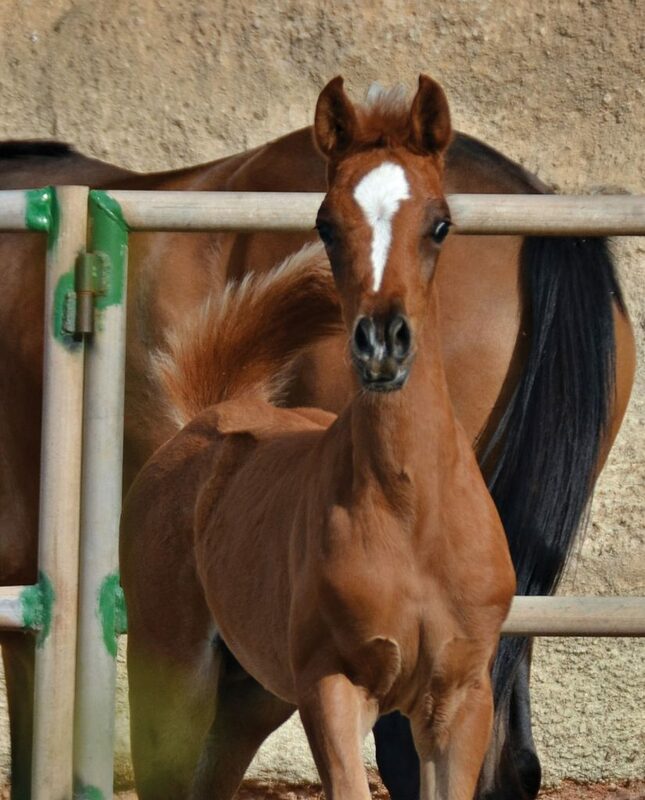 The 2017 filly Persia Le Soleil (ZT Magnofantasy x Halimashah Le Soleil), bred and owned by Elvis Giughera, Le Soleil Stud, Italy. The 2017 filly Pervinca Le Soleil (ZT Magnofantasy x Leilany Le Soleil), bred and owned by Elvis Giughera, Le Soleil Stud, Italy. 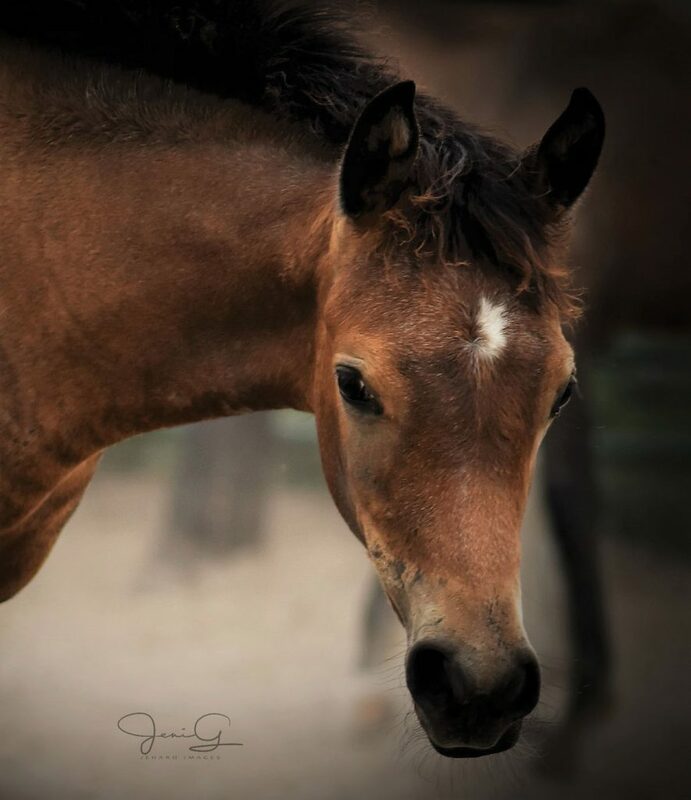 The 2016 filly Ain Dalal Baskette by Eliron Haman (El Hadiyyah x Eliron Bint Siria [VA Sirius}) and her dam TA Aloha (Travis MSC x *Ala AHSB by Alegro), owned by Sunny Gates, Fredericksburg, Texas. 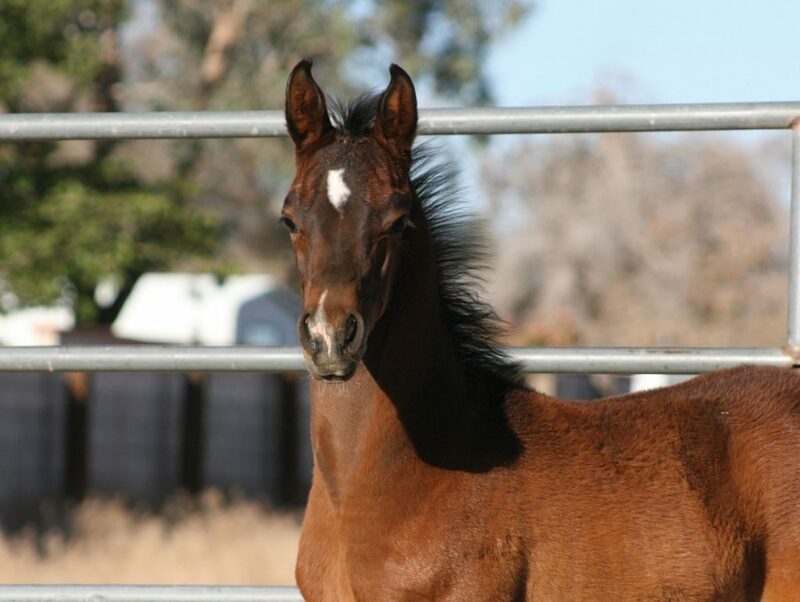 The 2017 filly I Dream of Genii (His Benevolence x WA Amber Gold), owned by Linda Walzer, Hughson, California. “She is a super sassy, smart, and sweet girl and the apple of my eye,” says Linda. 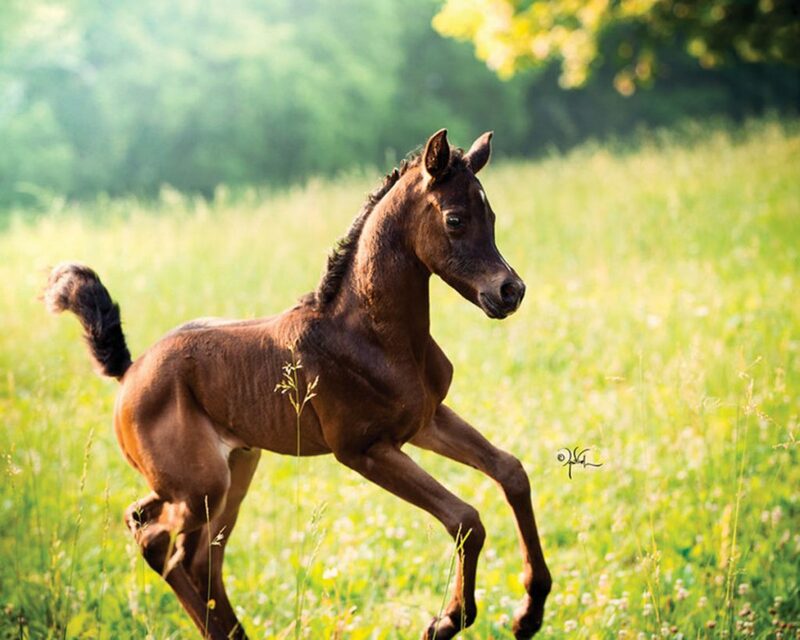 The filly Emmeline (*Kanz Albidayer x MSA Kataryna by *Parys El Jamaal) owned by Vicky Mangan, MJM Farm, Honeoye, New York. 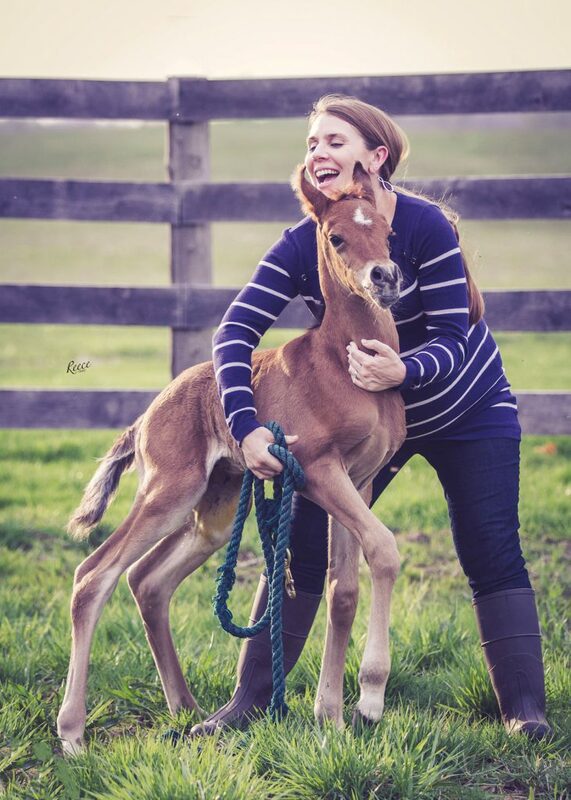 “Kataryna has graciously given us four fillies in a row (and raised an orphaned filly),” says Vicky. 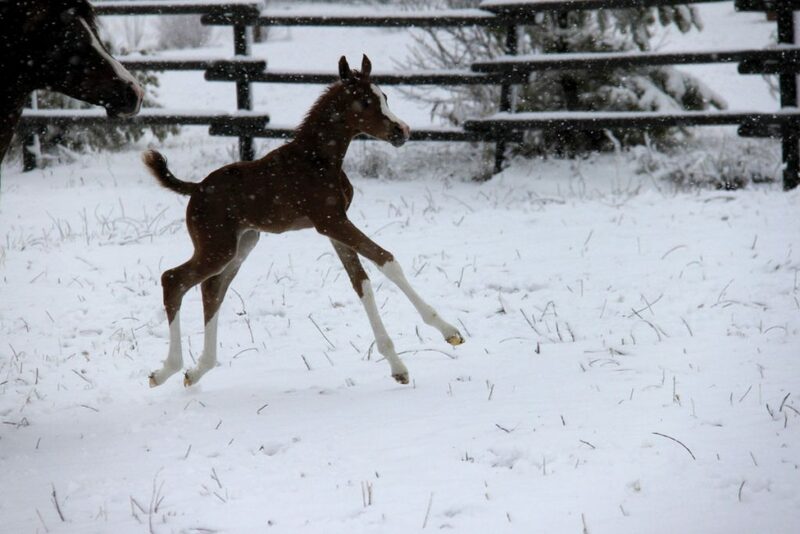 The filly Here Kitty-Kitty (SA Tomcat ASB x Solla Mia), owned by Sharon Shedd, Villa Park, Illinois. 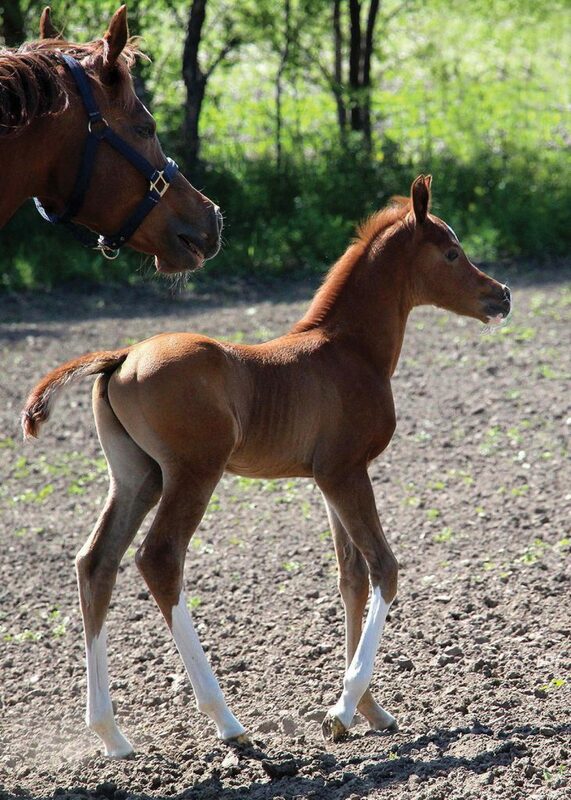 The straight Egyptian filly Hu Shaisheeda (Hu Shaihadi x Hu Sasheeda), bred and owned by Audrey Hughes, Hughes Arabians, Hubbard, Ohio. 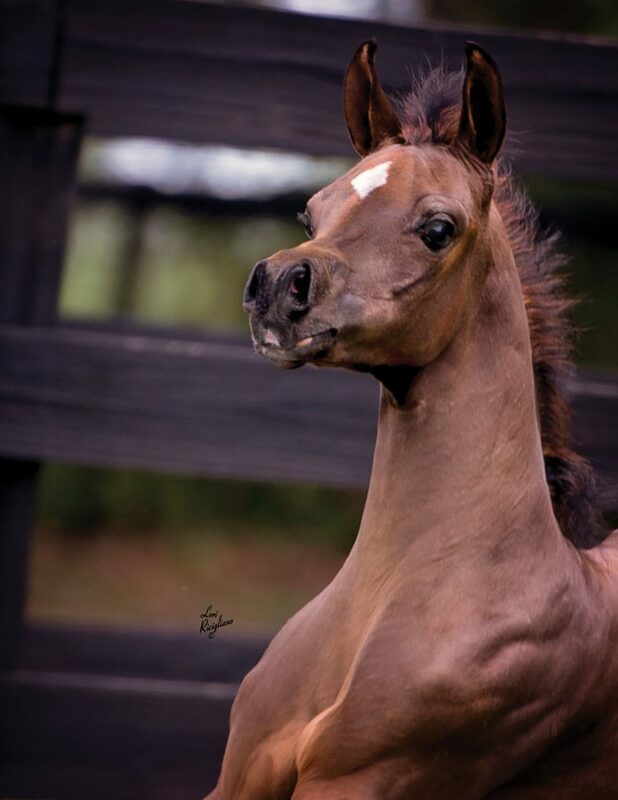 The 2017 filly Diamond Tsabella (Eliron Haman [El Hadiyyah x Eliron Bint Siria by VA Sirius] x Diamond Tsabrina [De Mohumed Ali x Diamond Tsable]), bred and owned by Angela Jenkins, Diamond Magic Arabians, Gilmer, Texas. 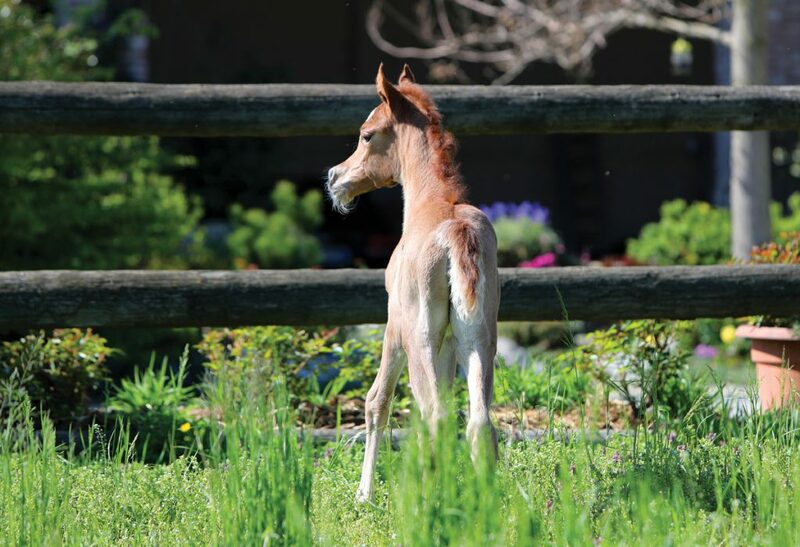 “Bella’s the first 2017 foal born at Diamond Magic Arabians, and the first daughter of my homebred mare Diamond Tsabrina. 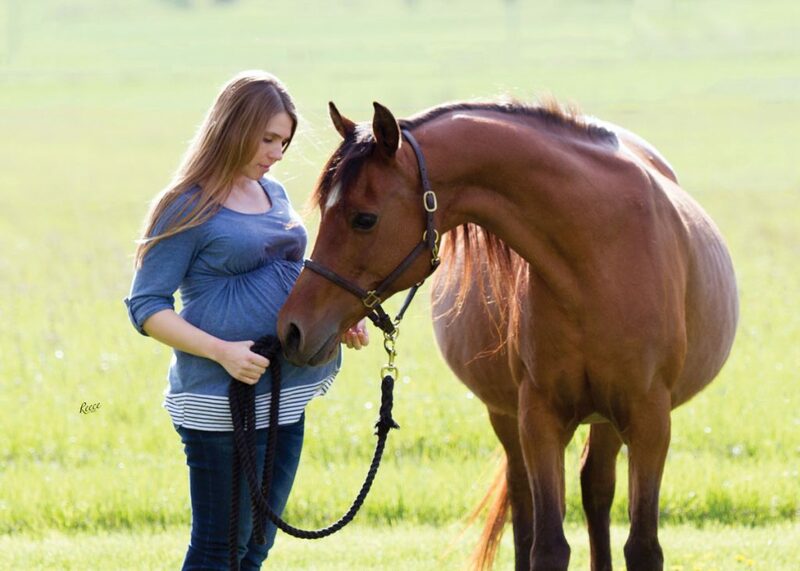 She is also the youngest descendant of my foundation mare, Diamond Tsable, and my first daughter of Eliron Haman, so she is doubly treasured,” says Angela. 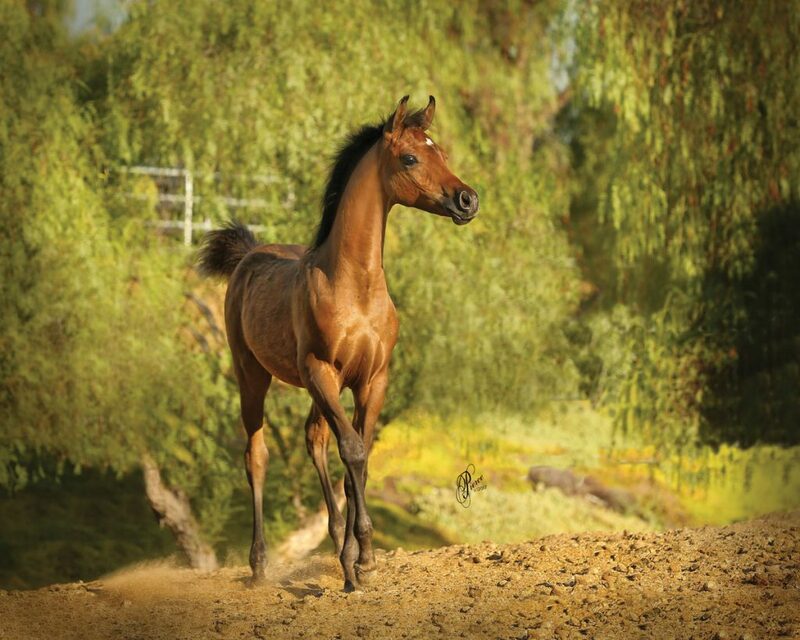 The 2017 colt Alqarat G (Qatari De La Rua x Alanah RV), owned by Amazigh Stud, Canary Islands, Spain. 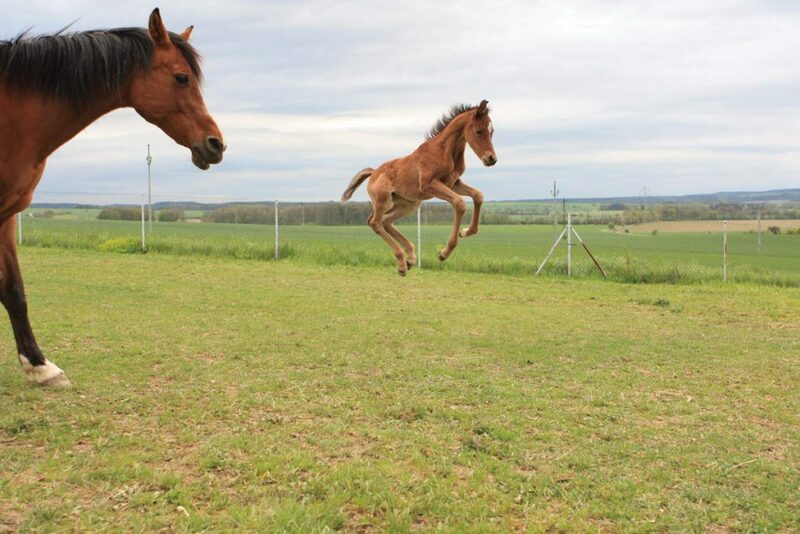 The foal Rozi (Bagir Ibn Balentina x Hevelia), owned by Michaela Nosková, Czech Republic. 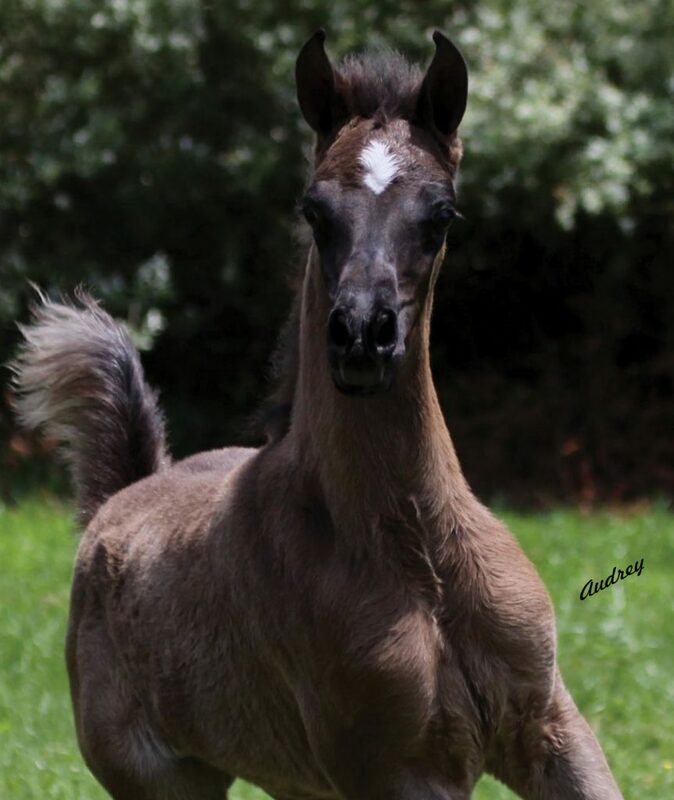 The 2017 Half-Arabian blue roan filly, not yet named, by Klint Black out of Shay Elekktrah, owned by Mike and Sandra Sicilia, Colbert, Washington. 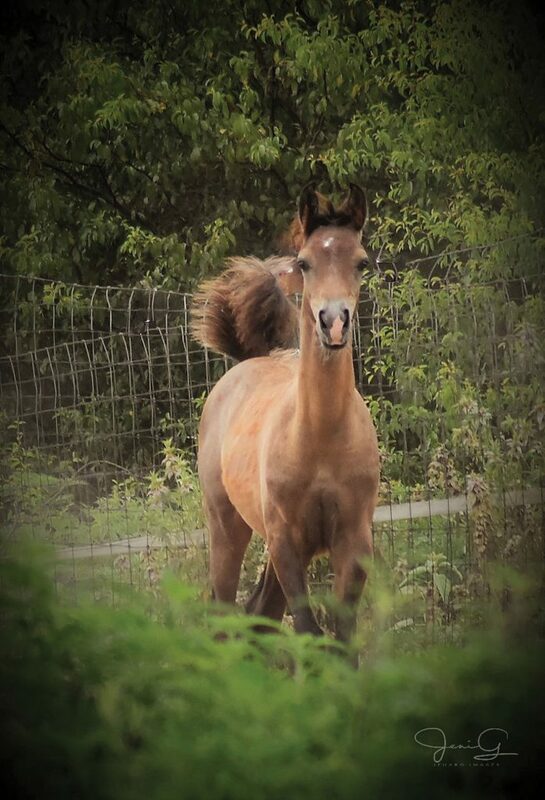 The 2017 colt Beckhams Fire VC (Beckham UA x Zims Fire Lady), owned by Paul and Nikole Reece, Victoria Cross Farm, Gladwin, Michigan. The first born son by Beckham UA was born three hours after the Reeces had their first born son, Jack. 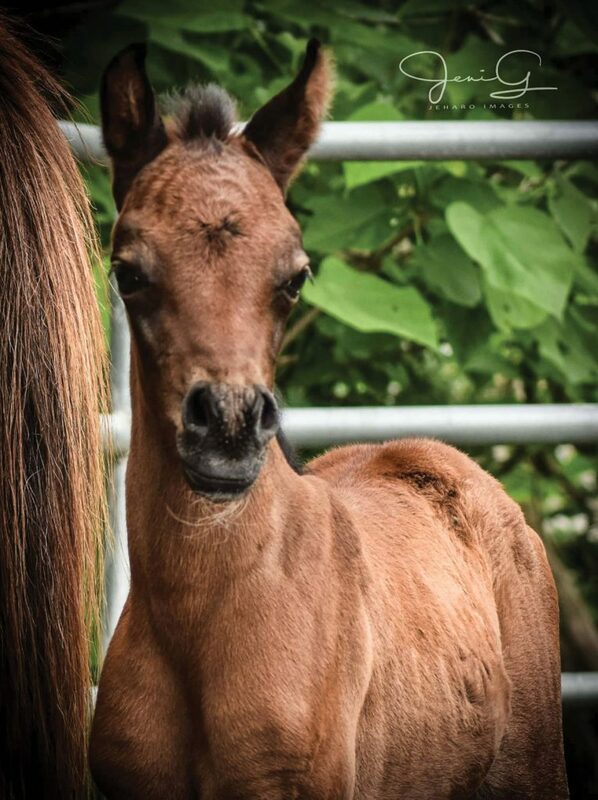 The 2017 colt Giovali VC (Gazali VC x Donna Gee HCF), owned by Paul and Nikole Reece, Victoria Cross Farm, Gladwin, Michigan. 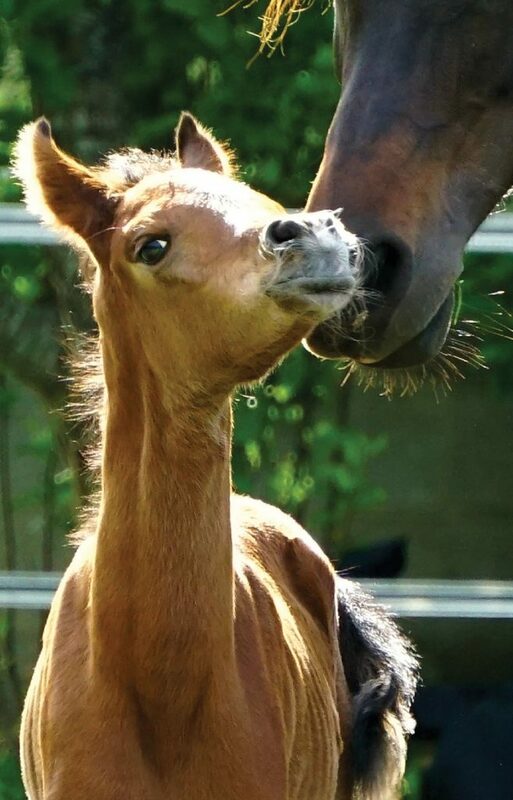 The four-day-old purebred Arabian colt Kustom Khrome AVR (Khaberet PGA x Fanci W), bred by Kathy Padgham and owned by Angela Lyons, Edmonton, Alberta. 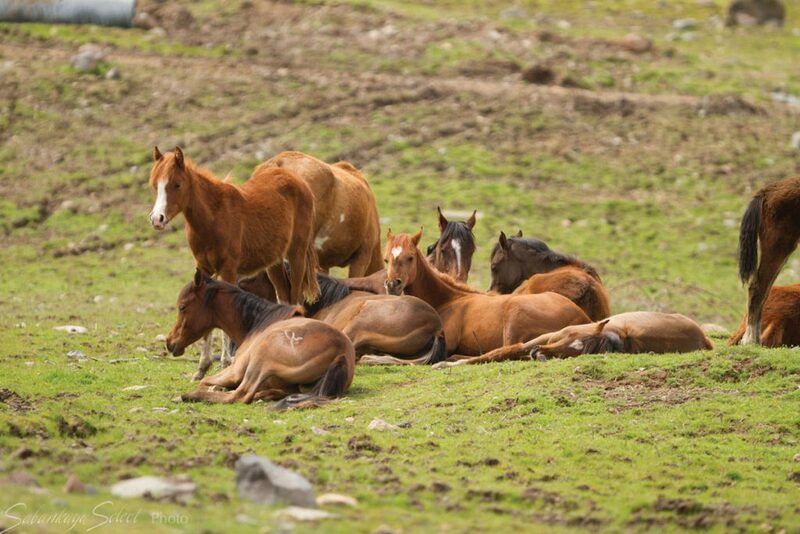 “Here’s a hodgepodge of *Calypso OS (Ajman Moniscione x AB Nastrapsy) colts and fillies just hanging out, living like rockstars, enjoying the good life (makes me jealous, as I’m in here glued to the computer struggling to catch up with past due taxes and other business paperwork),” says Chera Sabankaya, of Ottoman Arabians, Weed, California. 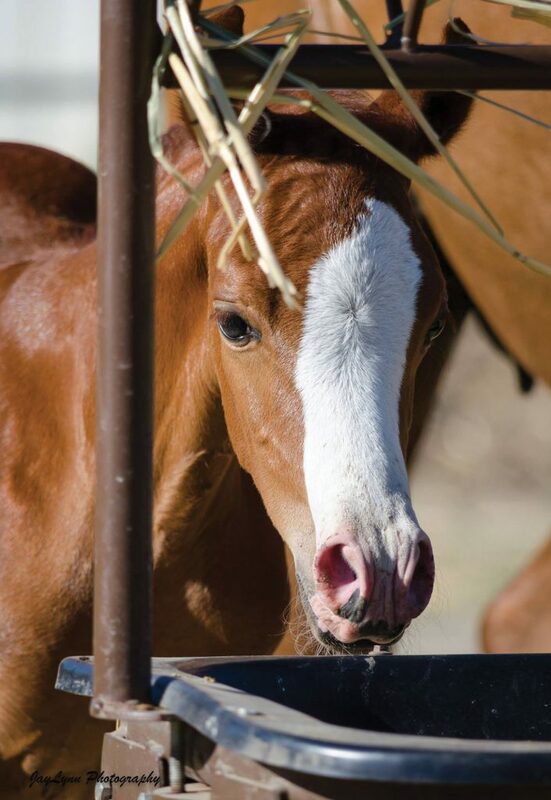 The 2017 filly SS La Bella (SS Calypsos Nabeg x EF Bella Contessa by QR Excel), bred and owned by Ottoman Arabians, Weed, California. 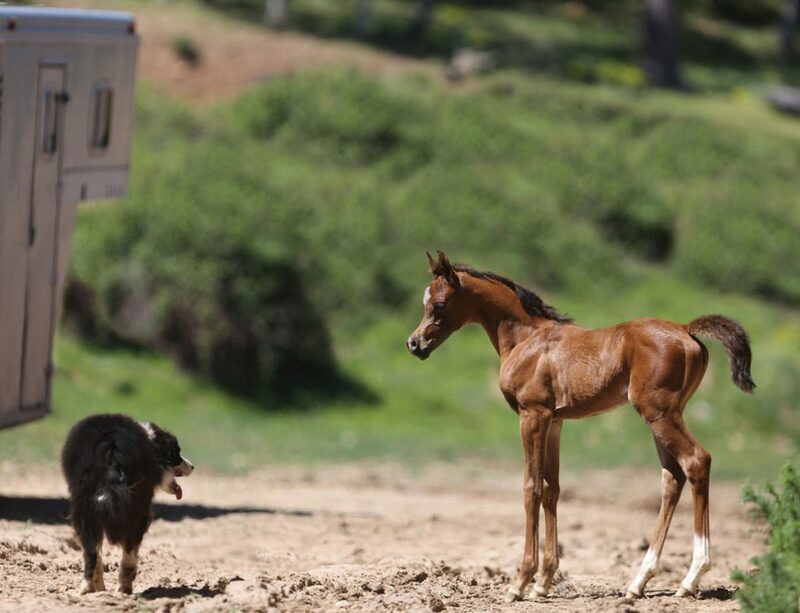 “She’s one of Calypso’s first granddaughters and one of our up-and-coming superstars, pictured here with our new herd dog, Sprocket, whom we adopted from the local shelter this winter,” says Chera Sabankaya of Ottoman Arabians. 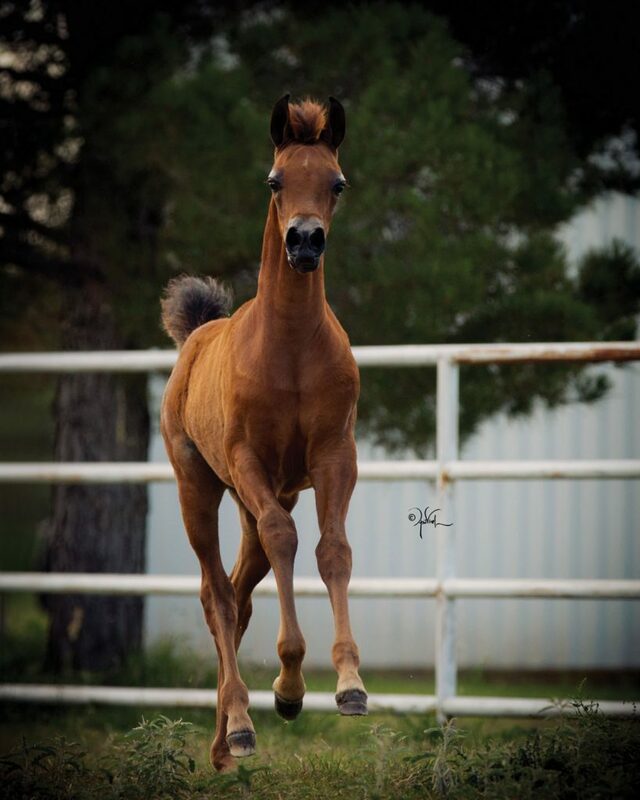 The 2017 filly WC Kharena (*Kanz Albidayer x WC Lady Bey Dakhara), owned by Holly Dillin, Western Cross, Weatherford, Texas. 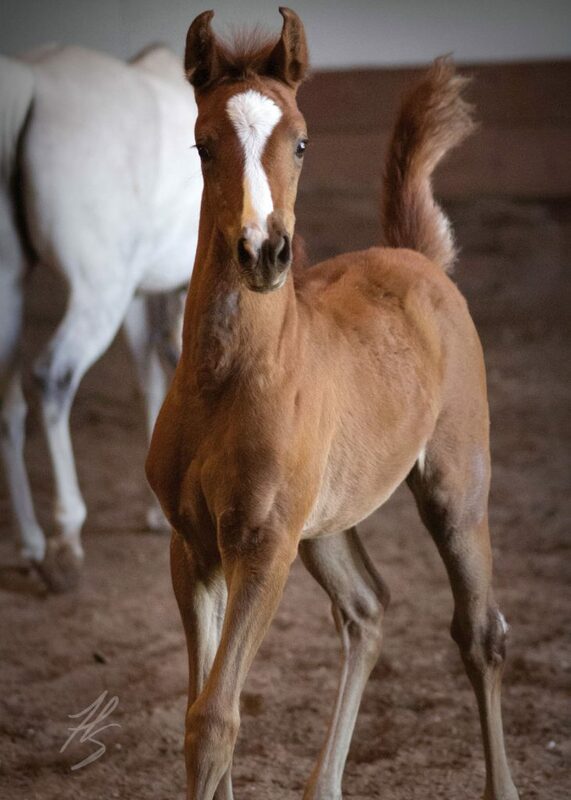 The 2017 filly Eluciv Diamond (Eliron Haman x Honeycreek Gold Lyric), bred and owned by Angela Jenkins, Diamond Magic Arabians, Gilmer, Texas. 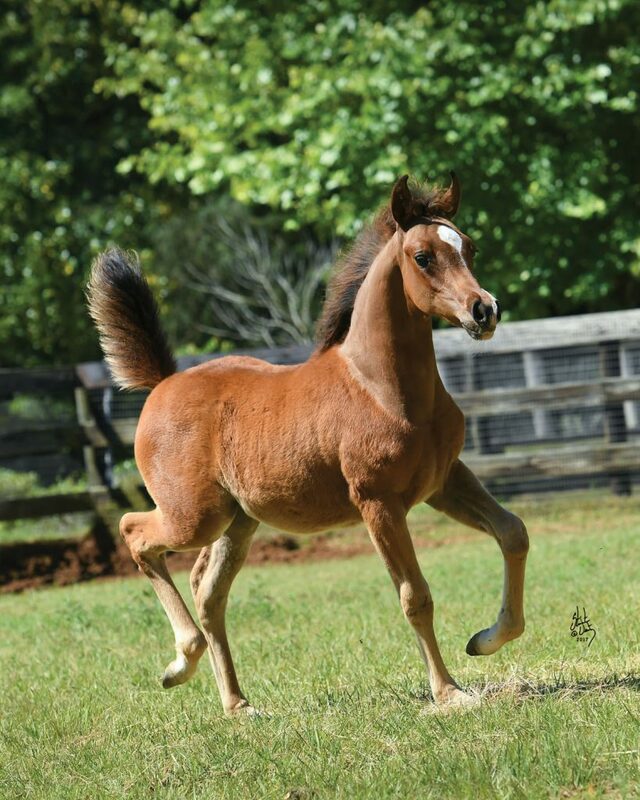 “This filly is a dream come true for me,” says Angela. 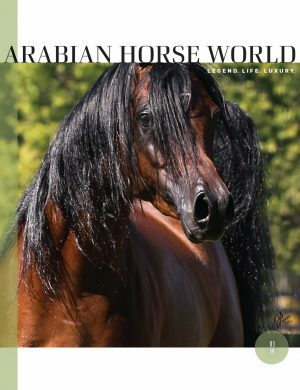 “She is a descendant of the first Arabian filly that I fell in love with, Princess Diamond, a chestnut daughter of Ferouk (Ferseyn x Hanida) out of Seahorse Princess Dorsaz (*Count Dorsaz x Al-Marah Ajajira) foaled at Diamond R Arabians in Allen, Texas, in 1971. I dreamed of her for the next 16 years until I could purchase her and bring her home. 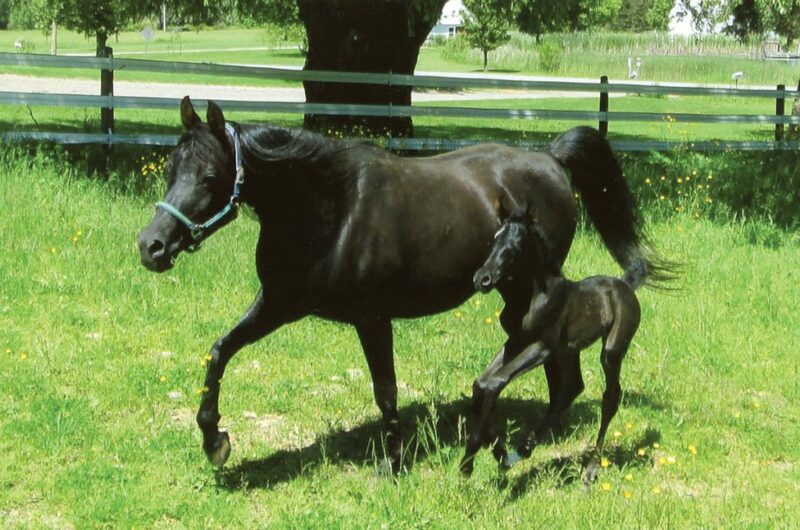 Princess spent the last 17 years of her life with me, as the pasture mate to my other Diamond R Arabian, the gelding Thunder Magic, who was my best friend for 32 years. 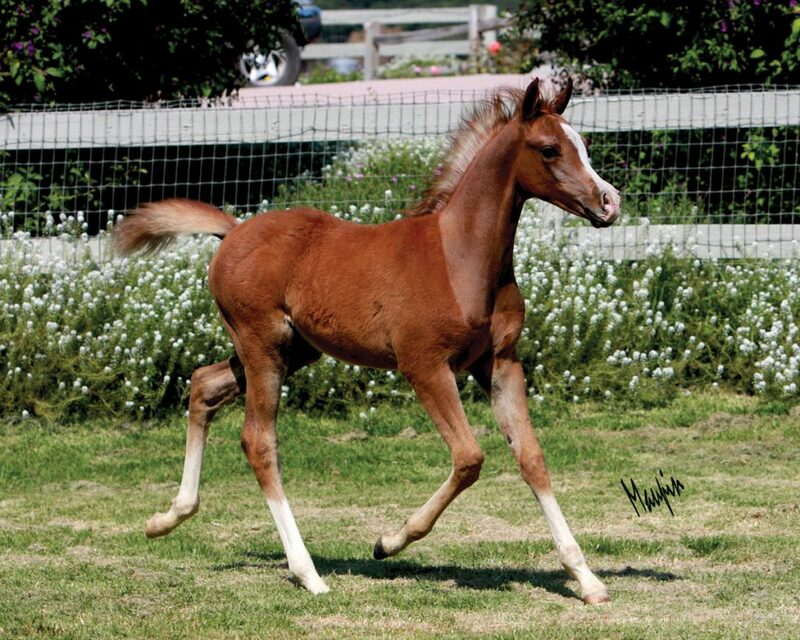 The 2017 filly (PA Gazsi x Simsimiya by Mazkarade), owned by Walt and Jeannette Lane, Esperanza Arabians, Riverside, California. 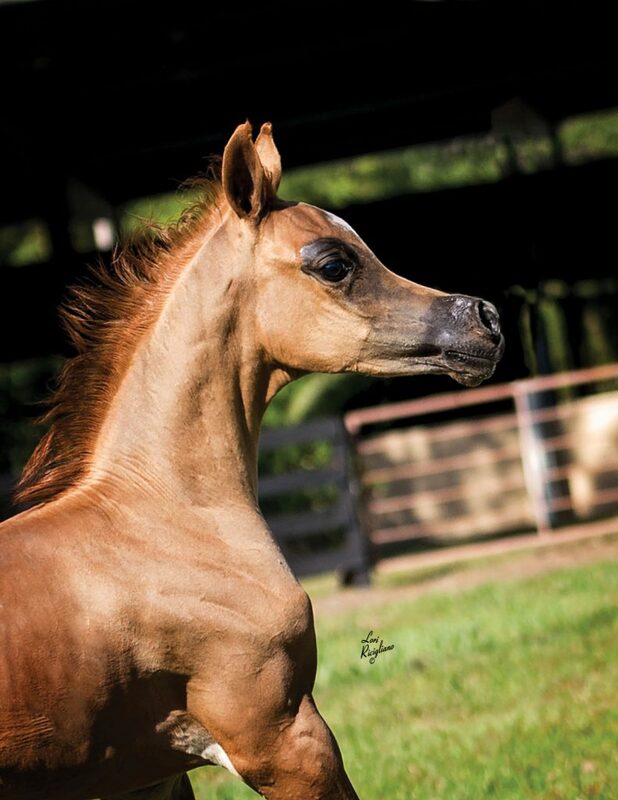 The 2017 colt Rohara Justamarajj (Marajj x S Justatinkerbell) owned by Roxann Hart, Rohara Arabians, Orange Lake, Florida. 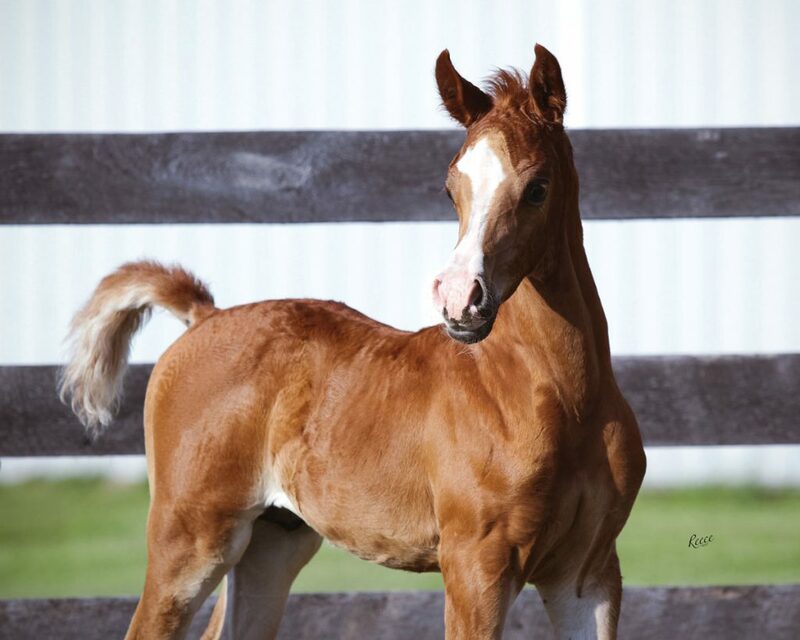 The 2017 colt Rohara Marcquee (QR Marc x Rohara Aida) owned by Roxann Hart, Rohara Arabians, Orange Lake, Florida. 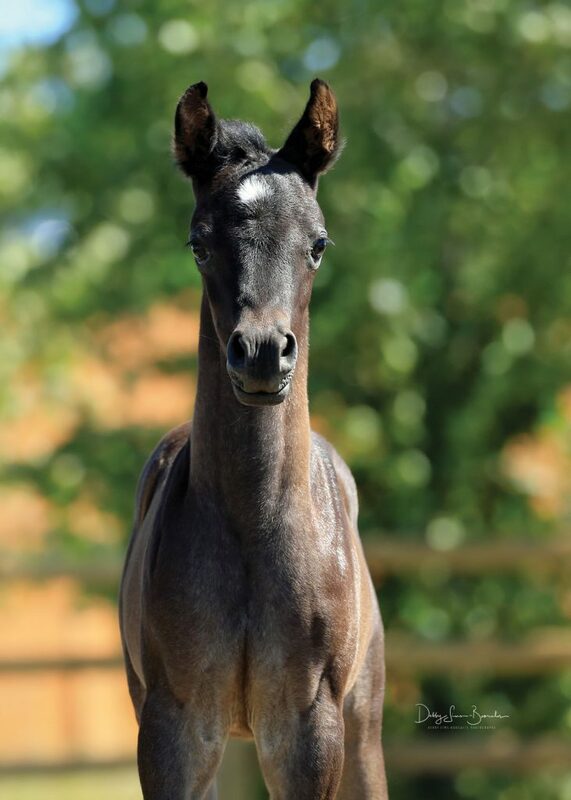 The 2017 colt Merlin Al Haman (Eliron Haman x Al-Marah Star Mark by AM Good Oldboy. 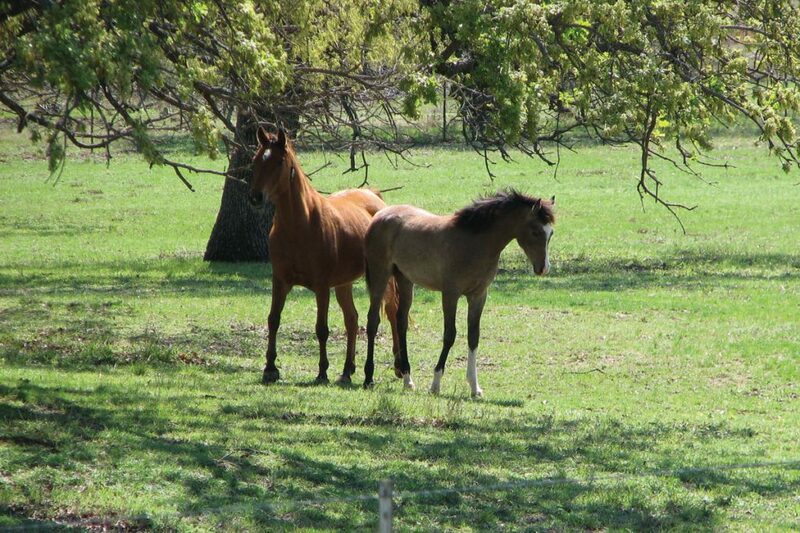 ), owned by Angela Jenkins, Diamond Magic Arabians, Gilmer, Texas.